AMD Memory Tweak is a new open source tool (amdmemorytweak) introduced by Eliovp and A.Solodovnikov. It is a tool that allows you to change memory timings on the fly - kind of like ETH Pill for AMD. This tool is also Vega friendly. Our mining OS supports AMD Memory Tweak and can be used through the console or managed from the dashboard. 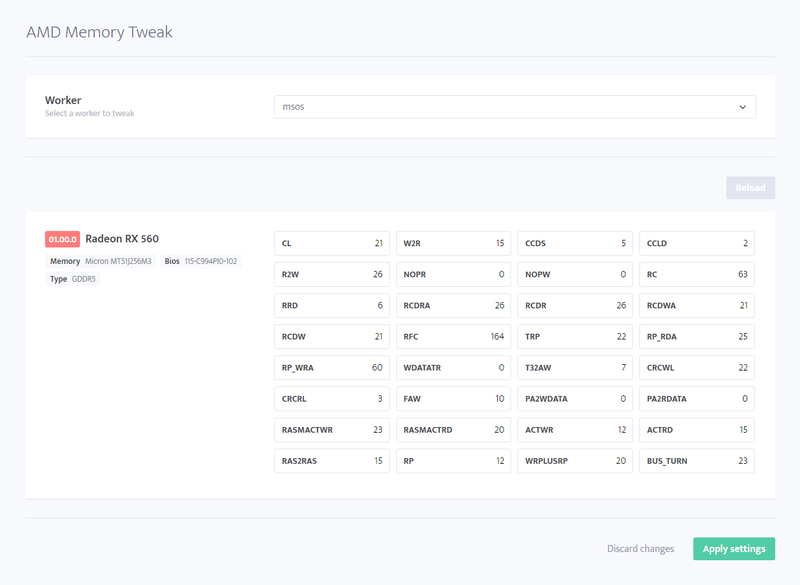 When editing from the dashboard, the values will be saved to the database and then preloaded to the rig on every boot. Values can be reset by clicking on the button Reload. If you prefer to use the tool from the console, here are some useful commands and parameters. You can read more about our dashboard implementation on our Medium blog. Which WiFi devices are supported by msOS?How to disable ETHLargement pill on Windows node?Does your ETHlargement pill not work as expected?AMD Memory TweakNvidia VBIOS flashingWhere can I found source code?Does minerstat offers API?